Line-up: Please line up by 6:30 p.m. in room 111. A small number of students are selected by the Reinhardt faculty to participate in the Baccalaureate and Commencement ceremonies based on their academic achievement, activity, leadership, representation and faculty references. They must also represent the character, integrity and mission of Reinhardt University. What is a Baccalaureate Service? The Baccalaureate Service is a medieval tradition that incorporates the custom of presenting the candidates for the degree of bachelor (bacci) with the laurels (lauri) of sermonic oration. Legend states that the baccalaureate ceremony can be traced as far back as a statute dated 1432 at Oxford University that required each bachelor degree candidate to deliver a sermon in Latin as part of his academic exercise. 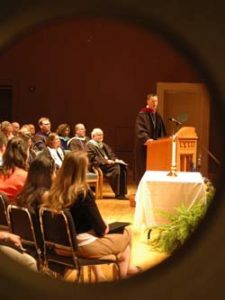 Because the earliest institutions of higher learning in this country were founded primarily to educate clergy, the British practice of a baccalaureate service has continued. Today, the baccalaureate service is a farewell address delivered as a sermon to a graduating class, and as an institution of faith, Reinhardt continues to celebrate this tradition. Handicapped parking: in designated areas adjacent to the event location. When should Guests arrive? Guests should arrive at least 15 minutes prior to the beginning of the ceremony. Seating is first-come, first-serve, so earlier arrivals have more seating choices. Graduate Dress: Graduation gowns without caps.